Posted on December 4, 2013	by Steven R. Cook, D.Min. About Steven R. Cook, D.Min. Steven is a Christian educator. His webpages communicate evangelical Christian doctrines and topics. Steven earned a Master of Divinity degree in 2006 from Southwestern Baptist Theological Seminary and completed his Doctor of Ministry degree in 2017 from Tyndale Theological Seminary. His articles are theological, devotional, and promote a biblical worldview. Studies in the original languages of Scripture, ancient history, and systematic theology have been the foundation for Steven’s teaching and writing ministry. He has written several Christian books, dozens of articles on Christian theology, and recorded more than three hundred hours of audio and video sermons. Steven worked in jail ministry for over twelve years, taught in Bible churches, and currently leads a Bible study each week at his home in Arlington, Texas. 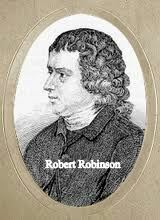 This entry was posted in Hymns & Poetry and tagged Come Thou Fount Of Every Blessing, Jesus sought me when a stranger, My wandering heart, Robert Robinson. Bookmark the permalink.